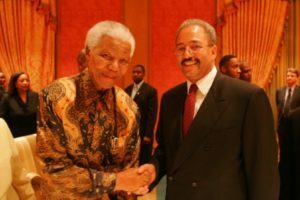 A. Shuanise Washington, president and CEO of the Congressional Black Caucus Foundation, Inc., (CBCF) today released the following statement on the passing of human rights activist and freedom fighter Nelson Mandela. “The Congressional Black Caucus Foundation is deeply saddened by the passing of a great leader, revolutionary freedom fighter, and our friend, Nelson Mandela. “CBCF joins the people of South Africa and billions around the world to honor the life and mourn the loss of Mandela, a human rights icon and peacemaker who triumphed against great persecution to improve the lives of others. “Many from the United States, including members of the Congressional Black Caucus who had been working tirelessly to end apartheid, journeyed to South Africa to witness the historic inauguration. It was a turning point for South Africa and a landmark for the world. “Even after his retirement, Mandela worked determinedly to combat HIV/AIDS, racism, poverty and inequality through the Nelson Mandela Foundation. His unwavering commitment to improve the quality of life for those less fortunate; to create access to opportunities for those living on the margins and in the shadows of society; and to empower people to pursue their dreams is a commitment CBCF shares. “A rare and special gift to our world, Nelson “Madiba” Mandela was a man of incomparable strength and unyielding resolve. His legacy of moral excellence shall outlive his time with us. He leaves our world a better place.